"A remotely controlled body called Avatar"
Jeremy and I took advantage of a free afternoon (thanks to Grandma Elizabeth) and headed out to the movies! Our destination - AVATAR. We love big budget movies. We live for the thrill of entertainment - no matter if it's sci-fi, fantasy, action or comedy. And this movie did not disappoint. We were drawn in from the very beginning. The idea of the Avatar - a remotely controlled body - was intriguing. The futuristic technology, new planet, and alien race was so fascinating. 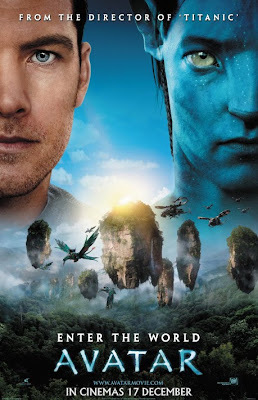 As we were introduced to this new population (the Na'vi) that lived on the new planet (Pandora) it was purely awesome and refreshing to learn about their culture and spiritual beliefs. The computer graphics and images added to this incredible introduction to the Na'vi. It was an amazing show. It should have been for the most outrageous budget it took to create. We've debated about taking our 2 older boys - they would love the action, but it is long (162 mintues! ), it is PG-13 for alien violence and some language, and it's slightly over their heads. We are still undecided on that. But you, you should definitely go. Go before Christmas Break is over. This is a must-see-on-the-big-screen show. We give it 5 "seed of the Tree of Souls" out of 5 - yes, it was THAT good. Every year, just a few days before Christmas, we take a trip up to the Tenaya Lodge. The kids like to call it the Christmas Hotel because it's decked out for Christmas! Santa comes in the evenings, there is a free hot chocolate bar, and in the lobby stand a 50 foot decorated Christmas tree. It is a great way for all of us to unwind from a busy Christmas season and just spend time together. Our usual activities include, sledding, snowball fights, ice skating, swimming/hot-tubbing in the indoor heated pool, sittin' in the steam room, and hanging out in the lobby in the evening playing games. Here are several quick snapshots from our one night adventure. I love the last one of Logan coming down the hill - the look on his face just after he hit the bump was priceless! While the boys were up at the snow for their ski day, the girls (and Jackson) got to go for a date. We began at the dollar store - their favorite place to shop - and picked up some movie treats while we were there. 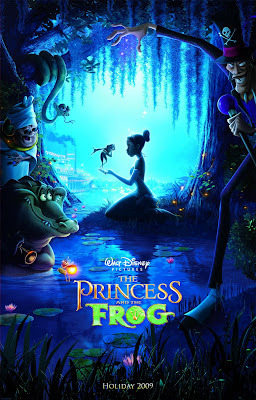 Our movie of choice was the new Disney show The Princess and the Frog. It has been a long time since Disney released their last princess movie. And this is a traditional princess movie - no 3D (we'll be so happy when the 3D movie phase is over! ), no computer graphics, no modern animation whatsoever! It was a real, down home, animated movie like they've always made in the past. The animators that created the look of this movie were the same ones that did Beauty and the Beast and Aladdin. There were many similarities to those older movies in the look and feel of this show and I liked that. The movie is set in New Orleans. We visited New Orleans a few years ago and it was quite a treat to see all of those places again. Of course they were animated, but still - it was fun to watch them come alive on the screen. The music was fun (Mama Odie's song "Dig a Little Deeper" was my favorite! ), the southern accents were so great, the story entertaining, the scary parts were not too scary, and it all wraps up so nicely in the end - just as it should in a fairy tale story. Take your family to a matinee during Christmas Break if you can afford it or just wait for it to come out on DVD. It is a must watch show. 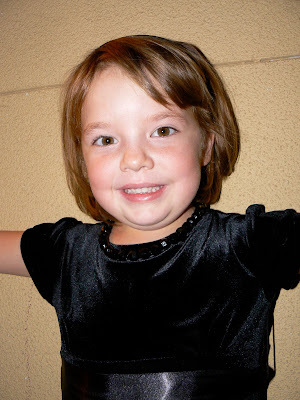 Your kids will tap their feet and clap their hands to the beat in several of the songs. We give it 4 wishing stars out of 5. 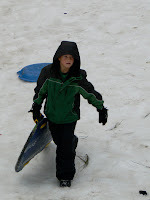 Jeremy learned to ski at an early age and has always wanted our kids to have the same opportunity. Two days before Christmas, Jeremy took the boys up to Badger Pass in Yosemite for their first skiing lesson ever. They were all thrilled to spend a "boys day" together. Cousin Jacob and Grandpa Doung also came along for the fun. They began at the bunny hill or the turtle hill (or something beginner like that) and practiced their pizza plow. They were unsteady at first, but gained confidence the more they worked at it. The boys looked really good by the end of the day. They had a blast! Here are 2 short videos: the first is their expertise in boarding the ski lift and the second is their awesome control when coming down the mountain. Trevor came home and made sure everyone knew that skiing was his new favorite sport. They all had an absolute blast. Thanks to Grandpa Doug for coming along and helping out - the boys loved all the attention and one on one time! Our annual ward Christmas Party is a fun event each year. The Fresno 7th Ward hosts a Christmas Breakfast at 8AM on the designated morning and everyone is encouraged to come in their jammies - including the adults! We eat a delicious breakfast, enjoy a short program, and then the special guest arrives - SANTA! The kids were all excited to see him this year because they each had specific requests they needed to make. Uncle Robb was the photographer for this event and did an excellent job. 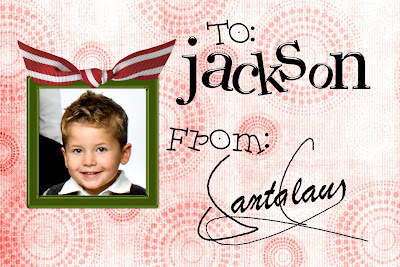 We just love the shared glance between Jackson and Santa - what a perfect moment to have preserved. Santa was good to us this year. 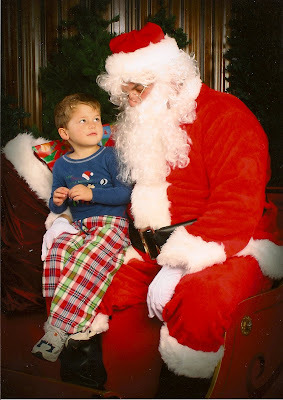 He brought all good things that were at the tops of the kids' wish lists. It was all due to the fact that they got a chance to ask him in person for the deepest desires of their hearts. 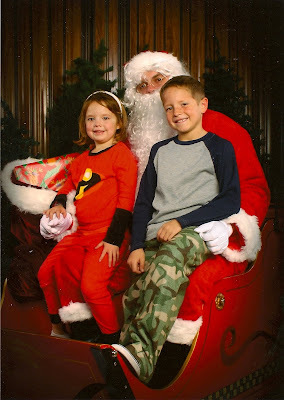 Santa stopped by our house on Christmas Eve. 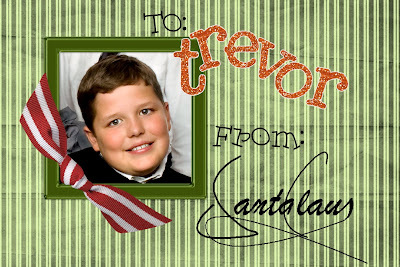 He left a great gift for each of the kids with their own personalized tag made by the elves in Santa's workshop! He even signed every single one! ...from our home to yours. Here's a short video about the true meaning of Christmas. 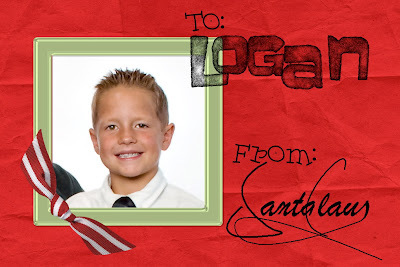 Trevor and Logan both decided to try out for the Christmas drama production at their school. There was much pressure from all of their friends that chose to try out also. They were thrilled when they made call backs and then both got a speaking part! All of their friends also made the show and they thought they were in for a great time hanging with their buddies at all the practices. They went to practices on Tuesday, Wednesday and Thursday mornings before school. It was difficult to get up 30 minutes earlier most mornings. By the end of the run there was real dread and foreboding about having to go to practice so early. Can you hear the whining? Even I was whining about it. All that whining and complaining switched to a different tune as soon as they performed for the first time. 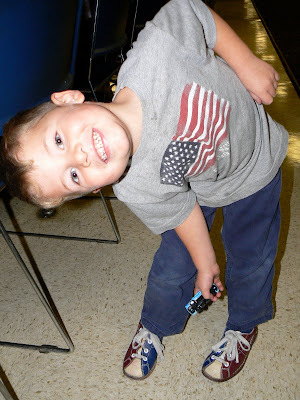 "Mom, I LOVE being on the stage - applause is the best part! I'm going to try out for the next show too!" It was Trevor who said all that. I was so surprised and thrilled to hear him say it with so much enthusiasm! They had a chance to perform 4 times. Once for the high school, once each for the lower and upper grades, and then finally they performed at the evening dinner/show production for the parents. They were pros by the end! The name of the play is "Mrs. Claus to the Rescue". Trevor's character name was "Lights" and Logan's character name was "Sound". They were part of the news crew that interviewed Santa when he couldn't make his deliveries on Christmas Eve due to illness. Here's a 20 second video of their big scene. Logan's line is cut short - you can only hear him saying the last word because I didn't get the camera recording fast enough. Trevor's line: Ok, if they stay on their marks! Here's where they stood for most of the show - on the risers singing with the choir. Here are most of their buddies that were in the show with them. 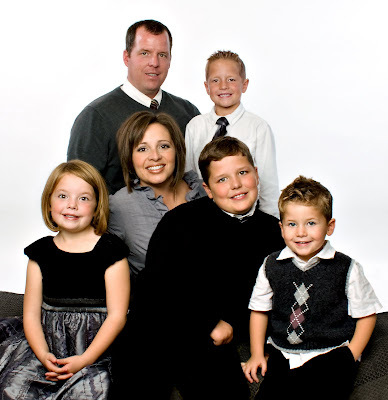 From L to R: Maddy, Trevor, Emma, Jacob C., Sammy, Jacob E., Logan, and Carter. My two proud boys. They were so pleased with their performance and felt good to have finished something that took so much work and dedication. Good job Trevor and Logan! You were the BEST Lights and Sound EVER!! We can't wait to see you on the stage again in the future - you are our Super Stars! Jeremy was in a great baking mood this month. 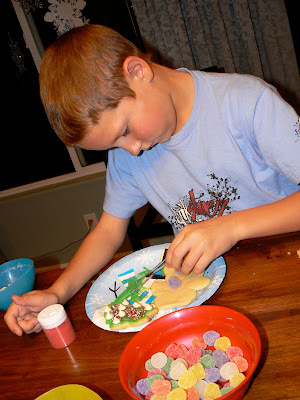 He researched the web and found a great Paula Deen sugar cookie recipe he wanted to try out. We rarely do sugar cookies around here only because I am never satisfied with the finished product that takes 4+ hours to create! I can never get the dough to keep it's shape. The cut outs always seem to round out and you can hardly tell that it was supposed to be a Christmas tree shape, or gingerbread man, etc. So when he said he wanted to try sugar cookies I was happy to let him take the reigns on this baby. We mixed up some red and green frosting. Mmmm..... sugar. We decked those babies out! Mmmmm..... more sugar! And no, Logan didn't take one bite of these sugary treats, but he sure had fun decorating one for each of us! Mmmmmm..... time to EAT all that sugar! Jackson thought the whole evening was fabulous. I should've taken a picture of his green lips when he finished this cookie. I like to think green dye is essential to happy childhood memories. Jeremy gets an A+ for an excellent finished product and an A+ for the fun factor. Woo hoo for fun Christmas activities!! Ok, so we're not really bowling with turkeys - it just sounded good for a Thanksgiving title. Every year (or, most every year) we go bowling the night before Thanksgiving. It's been a tradition for these past 10 years and it's a lot of fun! The kids look forward to it every year. Especially Jackson. He asks almost once a week to go bowling. He loves it! He plays too. He really plays. He never misses a turn and always has an eye on his ball so no one will take it from him. We had a nice visit with Aunt Dorothy and Uncle Jim as they came to visit for Thanksgiving. Jim is Gram's brother. It's always fun to see how much the kids have grown. We take these same cousin pictures every year of the 3 different age groups (and if I was really good I'd go dig up pictures from when these guys were still in their infant car seats from when they got to go bowling for the first time). It was a great time, especially because I whooped everyone with my 110 score. Woo hoo! Trevor's concert night was last Tuesday. This was his first year playing in band and singing in the choir. Yay for extracurricular activities in 5th grade!! Trevor played the trumpet for their 2 band songs: Christmas Parade and Jingle Bells. Here he is with his cousins Emma and Jacob. The "award winning concert choir" performed last. They sang 4 numbers - one was their Latin song they sang at the festival a few weeks ago. Trevor tells me that he really likes singing in choir. Note his concentration - he's so into it! It was a great night of music and holiday spirit. Trevor, thanks for sharing your talents with us! Christmas season is well under way in our house. We got an early start this year (Jeremy put up the outside lights before Thanksgiving!) and have been enjoying all the fun that comes with the decor. We did our traditional "put up the family tree evening" the Sunday after Thanksgiving. We ate a delicious dinner by candlelight, the kids opened their first gift of Christmas (an ornament) and then we decked the tree while enjoying cinnamon rolls and hot chocolate. Lizzie's showing off her 2 most recent ornament acquisitions - Lucy Loo from the Grinch and Rudolph the Red Nosed Reindeer's girlfriend. We are taking every opportunity to live up this holiday season. The kids open up a door on our advent house every morning and get a special surprise - like a tiny ornament, or a chocolate coin, or a note that says to play a Christmas CD while getting ready for school. We've been out to see some pretty Christmas lights. We've seen the kids' winter programs at school. We started wrapping gifts. And are already simmering our traditional Christmas potpourri every day. It's beginning to feel a lot like Christmas around here. Lizzie and Logan sang in their Winter Program last Tuesday night. It was a beautiful evening full of family, friends, and beautiful music. 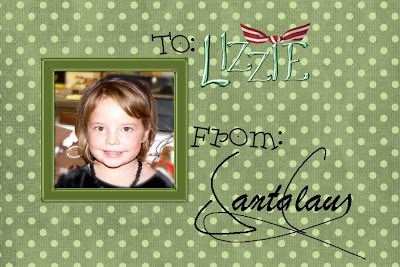 Lizzie (kindergarten) was up first. She was so secretive all month about the songs they'd perform. It was as if she was saving them for a big surprise just for us! They were so cute up there!! They sang Deck the Halls, Silent Night with sign language, recited a poem, Must Be Santa, and Rudolph. Lizzie was big time - she knew all the words and all the hand motions. She did great! Here she is after her performance with her best buddies - cousin Benny and Kaitlyn. Logan's group was the last of the evening. Those 3rd graders are soooo much older than the kindergartners! They were well rehearsed and ready to perform! They sang all 4 verses to Deck the Halls, Holly Jolly Christmas (Uncle Samuel sang this one when he was in 3rd grade too - how long ago was that?! ), and finished off with their favorite I'm Gettin' Nuthin' for Christmas! Thanks to all the grandmas, grandpas, aunts, uncles, cousins, and friends that came to support our kids on their big night! It was great! Let's do it again this Tuesday and the next!